The Sterling Recreation Center has an indoor pool and outdoor pool. The indoor pool has a capacity of 225, including the diving well and an outdoor pool with a capacity of nearly 450. The outdoor pool includes several water features including a Multi-Play 5 and three slides. The pool has a 50×50 beach entry as well as a separate wading pool with a mini water dome and six water jets. 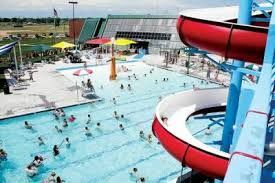 The largest attraction at the pool is the double flumed slide, complete with a translucent blue speed slide about 130 feet long and one open flume slide about 220 feet long. Picnic tables and chairs can accommodate over 300 patrons and the seven shade structures provide plenty of protection from the sun’s ultra violet rays.